Here is a special posting, a review written by frequent guest critic and writer for this blog, John W. Barker. Barker (below) is an emeritus professor of Medieval history at the University of Wisconsin-Madison. He also is a well-known classical music critic who writes for Isthmus and the American Record Guide, and who hosts an early music show once a month on Sunday morning for WORT-FM 89.9. For years, he served on the Board of Advisors for the Madison Early Music Festival and frequently gives pre-concert lectures in Madison. Barker also took the performance photos in the review. 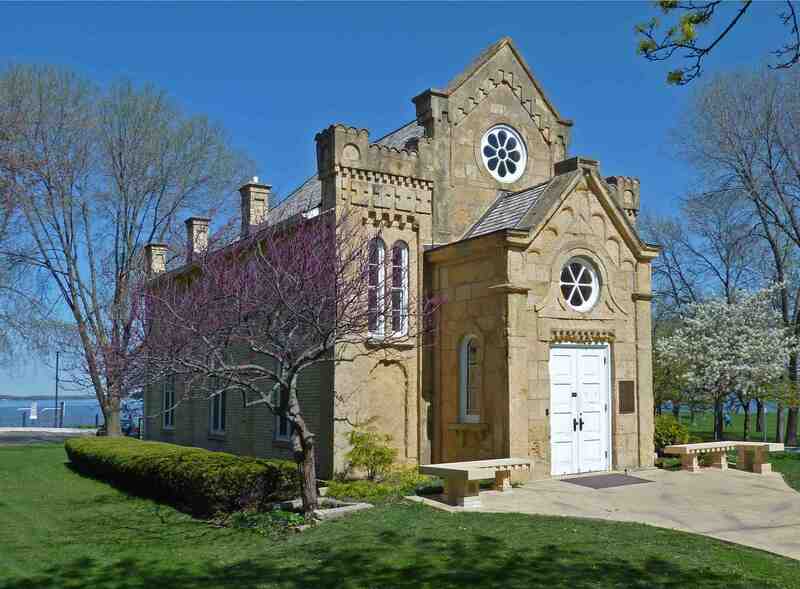 The season opener for the Wisconsin Baroque Ensemble was held last Saturday night at the historic Gates of Heaven Synagogue, in James Madison Park on East Gorham Street. An unusual feature of the program this time was a kind of running backbone: the music of the little-known 18th-century French composer Benoît Guilemant. From a collection of duo miniatures for flute and violin, six short pieces were sprinkled through the program. There was also a larger work of his, a Quartet Sonata, Op. 1, No. 3, for two flutes and violin with basso continuo. All these were spirited, clever and imaginative pieces that greatly delighted the audience. The French Baroque was further represented by a cantata by François Bouvard (1684-1760), sung by mezzo-soprano Consuelo Sañudo, with flutist Brett Lipshutz and violinist Nathan Giglierano taking obligato parts. The other veteran singer involved, soprano Mimmi Fulmer, delivered a pungent Italian mini-cantata by Barbara Strozzi (1619-1677). And, from the German Baroque scene, there was a fine Trio Sonata, Op. 1, No. 2, by the great Dieterich Buxtehude (1637-1707). You can hear it in the YouTube video at the bottom. The earliest music in the program was provided by Claudio Monteverdi: first, the delicious concertato madrigal, “Chiome doro” from the Seventh Book (1619); then three delightful pieces from the earlier Scherzi Musicali of 1607. 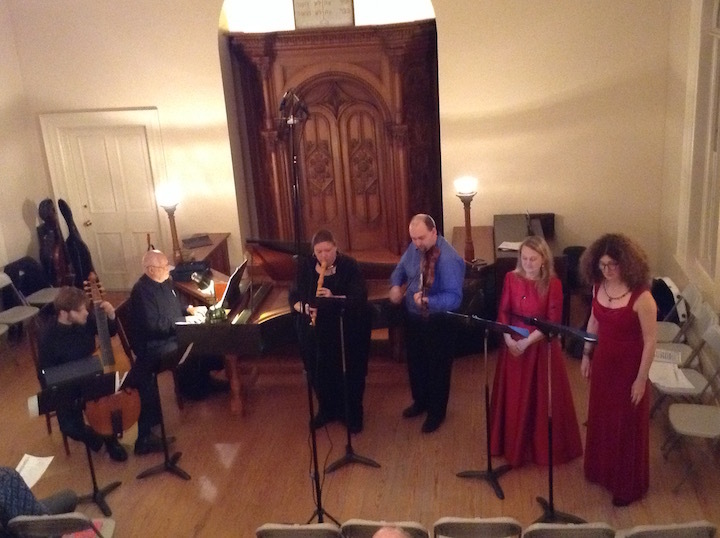 The ensemble this time consisted of eight performers. 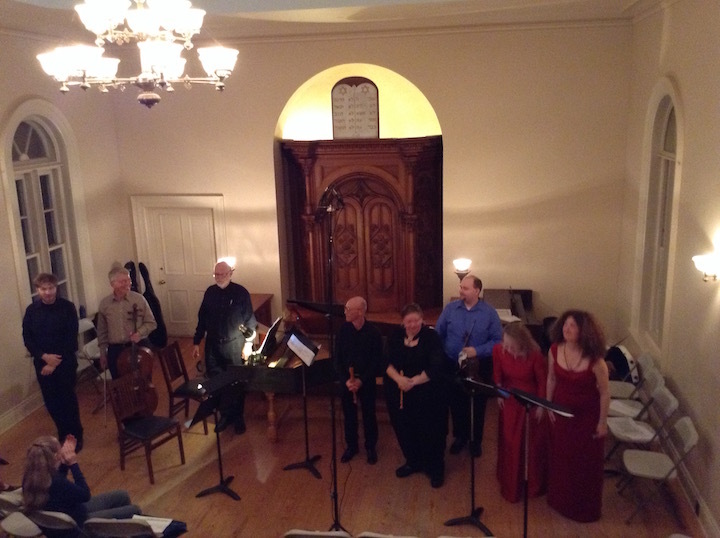 Besides the two singers and the two instrumentalists named, there were regulars like Eric Miller (viola da gamba), Monica Steger (flute, recorder, harpsichord), Anton TenWolde (cello), and Max Yount (harpsichord). Violinist Giglierano is a new presence in the group, and it seems as if he will be returning to the fold later this season. One hates to think that the audience was somewhat smallish due to football. But it was a lively and—as always and justly—an appreciative one. I guess “musica obscura” doesn’t come cheaply either: with tickets for this group at $20 for adults (apparently no discount for seniors) and $10 for students. This is the kind of concert that is free in Europe. I am sure this was a delightful performance and fun to play but this group, in my opinion, needs to ask what is its mission/role? (Even looking at their web site it appears that fun in performing obscure Baroque works seems to predominate. Not once are the words education, or outreach used). So, if the mission of the group is to perform this was likely a very successful concert. But if the group’s mission was to educate, or to reach out, it was an absolute failure. That is shown in the photos of what appears to be a largely missing audience and by the polite way the reviewer is telling the readers the audience was tiny. Probably the program itself was part of the problem; probably timing (yes, the big football game likely would have an impact on attendance). That should be quite obvious. The group’s own web site makes a playful, but surprisingly accurate comment on their musical selections: “musica obscura”. Now, there is nothing wrong in playing good music that has been neglected by others in the concert hall and on the radio (and other media). But the fact that this group was performing no less than 7 pieces by a truly obscure composer (Benoît Guilemant) should, one would think, have raised some red flags. (I looked for some Youtubes for Guilemant and could find none (zero); plus, zero biographical information available. That’s a bad sign, generally speaking.). If one is looking to educate and to reach out to others (Baroque music really is beautiful and deserves a larger audience than it has) then perhaps it is necessary to mix in less of the completely obscure and more of the familiar. A piece or two by any of the Bachs, by Handel, or by the likes of Telemann PLUS a selection or two from the obscure likely would work much better. But then, it depends on what the mission of the group is. 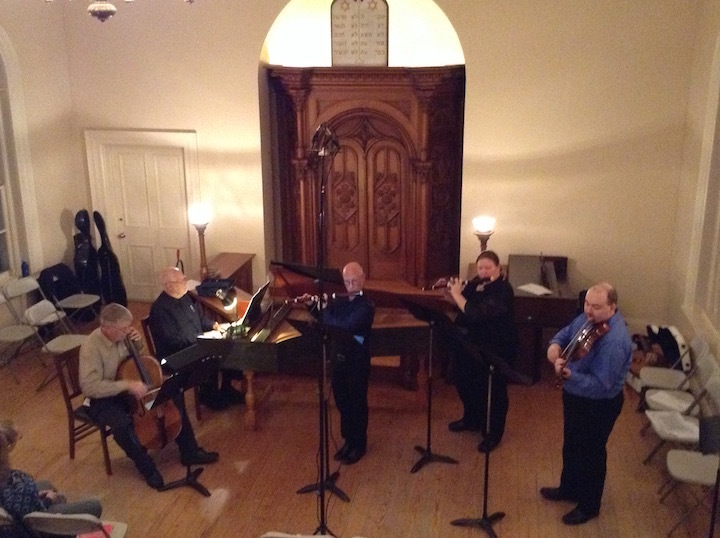 If it is simply one of performance and playing as a group together: this concert was likely a great success. Otherwise, not.